Plasma flow is studied in relation to another aspect of this thesis, namely the thermal wave. This section examines describes flows aligned with the applied background magnetic field, i.e., parallel flows. A comparison of the time evolution of parallel flow between measurements and a theoretical model is presented in Fig. 6.1. The model is designed using Eqs. (2.4)-(2.7). This analysis is restricted to the early times that correspond to the classical transport regime of the filament. The position of this measurement is (r,z) = (0, 384) cm. The rise in the measured flow velocity immediately after beam heating begins is not captured in the model result. It should be noted that differences in the numerical values between the flow measurements and the code are expected to be larger than those observed for temperature comparisons. The model calculates flow values by solving for the absolute value of the flow and then normalizing it to the sound speed as calculated using its own temperature value. Therefore, any differences present in the absolute flow speed (which cannot be measured by the Janus probe method) are compounded by the differences in temperature. Figure 6.1: Comparison of measured and theoretical parallel flows in the filament center for early time evolution. The model result captures the qualitative behavior of the flow, except for the initial (and possibly transient) increase in magnitude. The measured trace has been smoothed to reduce higher frequency fluctuations. 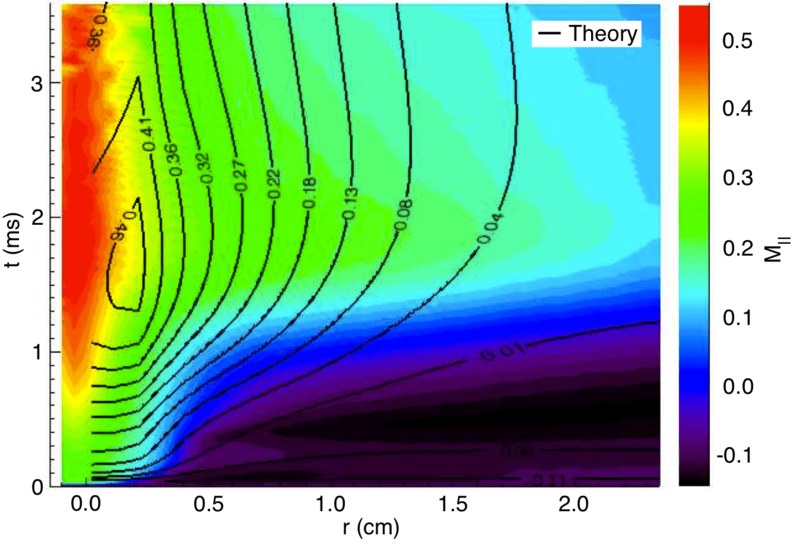 Figure 6.2 compares two-dimensional flow profiles from the experiment with the results of the fluid code that is also used to compare classical temperature profiles. The result is shown for the axial position z = 384 cm. The qualitative agreement is excellent as both results identify a wide radial profile of plasma flow. One difference is the sharp edge that appears just after t = 1 ms in the measurement. It is not yet understood why the model would result in a softer edge profile. The direction of the flow also agrees within these two representations. Early in the filament evolution and far into the outer region of the radial profile, the flow is directed toward the LaB6 beam source. Some time after the heating process has begun, this direction is reversed. Pressure gradients naturally present in the afterglow plasma compete with those generated by the beam heating. This interaction may explain the sharp boundary observed in the experiment but not entirely reproduced by the model. Figure 6.2: Parallel flow velocity as measured (color contour) and as predicted by classical theory (black lines). Quantitatively, the agreement between the model and the measurements is nearly perfect at the far edges and early times, and better than 20% at the filament center. The gradient region exhibits larger discrepancy between the values (e.g., at t ≈ 2 ms and r > 1.5 cm). The theoretical result places the peak flow just off the center of the filament. It is noteworthy that the largest absolute value of flow is centered on the filament in the model. The off-center feature occurs because the model temperature profiles decrease faster than the absolute velocity. The temperature decline in the radial direction reduces the ion sound speed much faster than the corresponding reduction in absolute flow speed. 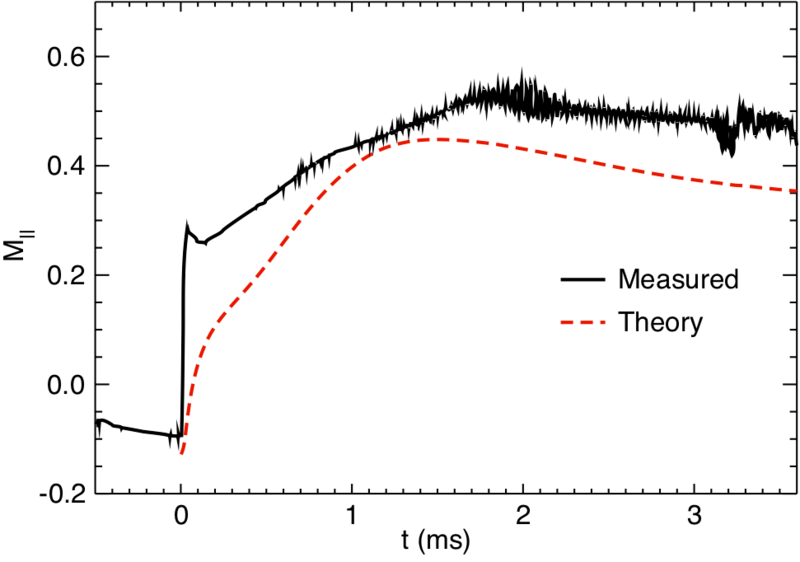 Similar off-center peaks in Mach number are not observed in the measurements. Figure 6.3 is a plot of the measured and theoretical electron temperatures and flow profiles corresponding to time t = 1.3 ms in Fig. 6.2. This display clarifies the evaluation of that preceding contour. Both radial profiles are broader than typical temperature profiles for the filament. The measured profile exhibits a steady decay of the flow and appears to never reach a lowest level. This contrasts the result from the model in which the profile is still broad but does flatten out near r = 2 cm. An interesting overview of flow behavior across multiple axial positions is shown in Fig. 6.4, which presents contours of the parallel flow as functions of radial position and early time. Notice that panel (b) was acquired with a radial range that differs from the other two contours. Panel (a) displays the flow from within the heat source region, Q, at z = 64 cm. Oscillations arise near t = 1 ms that are comparable to those shown in the time trace of Fig. 2.12. 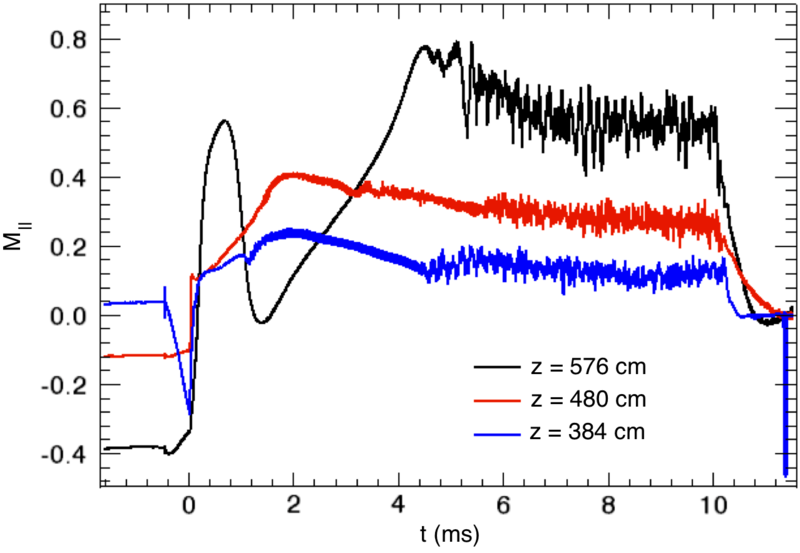 These same oscillations are also observed at the other axial positions of z = 224 cm in (b) and z = 448 cm in (c). The downstream regions demonstrate the coherent fluctuations prior to their appearance in the Q region. Panels (b) and (c) exhibit striations (which are representative of oscillations in this contour display) before t = 1 ms and they do not appear until after this time in (a). This observation suggests that the cause of the oscillations is within the heated filament and not driven by the beam heating directly, i.e., there are no such oscillations in the applied heating power. Figure 6.4: Parallel flow contours at different axial positions for the same experimental parameters, Bo = 900 G, Vbeam = 20 V. These are not from the same discharge, however, because a number of discharges is necessary to obtain the contour measurement across the radial dimension (note also that (b) is acquired across a narrower radial span than the other panels). (a) z = 64 cm (b) z = 224 cm (c) z = 448. Figure 6.4 also highlights the time evolution of the broad flow profile. This is determined by the interface of the opposing flows in the r > 0.1 cm regions. The negative flow values of (a) indicate that the plasma is flowing toward the LaB6 electron beam. Plasma flowing away from the beam is restricted to a region narrower than the beam diameter. At z = 224 cm the flow direction changes suddenly near r = 0.1 cm and t = 1 ms. The profile of flow away from the LaB6 crystal extends out to r > 0.2 cm. Finally, at z = 448 cm the flow directed away from the heat source reaches out to r > 1.0 cm, far wider than at the other axial positions. Similar profiles are predicted by the code because the parallel gradients are largest away from the LaB6 crystal. Closer to the LaB6 source, the parallel pressure is flat and the flow drive is reduced. Furthermore, the background electron temperature is lower farther from the beam, leading to a much lower ion sound speed and greater Mach number even in instances in which the absolute flow speed is constant. An example of the time evolution of the Mach number at different axial positions is given in Fig. 6.5. The time evolution of the flow at the filament center confirms the larger Mach numbers corresponding to larger z values. 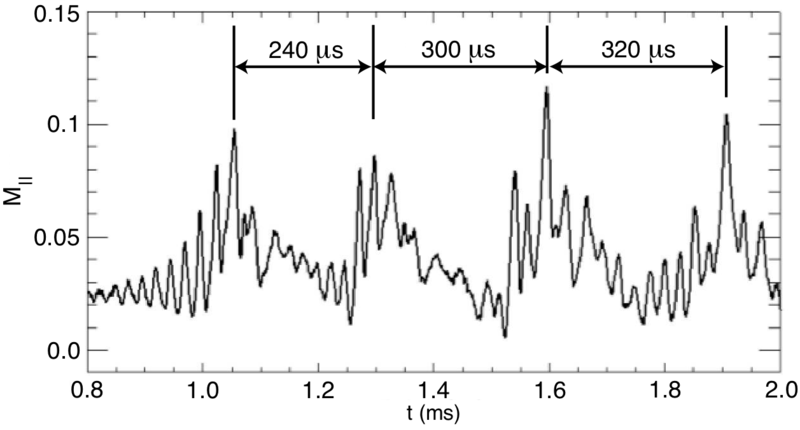 Large amplitude fluctuations appear first at the z = 384 cm position (t ≈ 4.5 ms). Similar fluctuations next appear on the z = 576 cm trace just after 4.5 ms and then finally appear on the middle axial position near 5.5 ms. Figure 6.5: Parallel flow at the filament center for three different axial positions. The axial positions are z = 576 cm (black, top trace at t = 8 ms), z = 480 cm (red, middle trace at t = 8 ms), and z = 384 cm (blue, bottom trace at t = 8 ms). Measurements of parallel flow in the center of the filament indicate that the thermal wave modulates the flow. Figure 6.6 is a plot of the parallel flow at the filament center in the Q region at z = 64 cm. The time separation between the largest peaks in the flow correspond to the period of the thermal wave measured in the same parameter regime (but not in the same discharges). The higher frequency oscillations in Fig. 6.6 are approximately 35 kHz, placing them within the frequency range of the coherent drift-Alfv$eacute;n mode. The earliest range of the plot shows growing amplitude for these oscillations with a culmination in the large peak that sets the beginning time for comparison to the thermal wave. Figure 6.6: Time trace of parallel flow at the filament center in the Q region. The time period between large amplitude peaks is highlighted for comparison to the similar period of the thermal wave. The faster oscillations correspond to the drift-Alfvén wave. 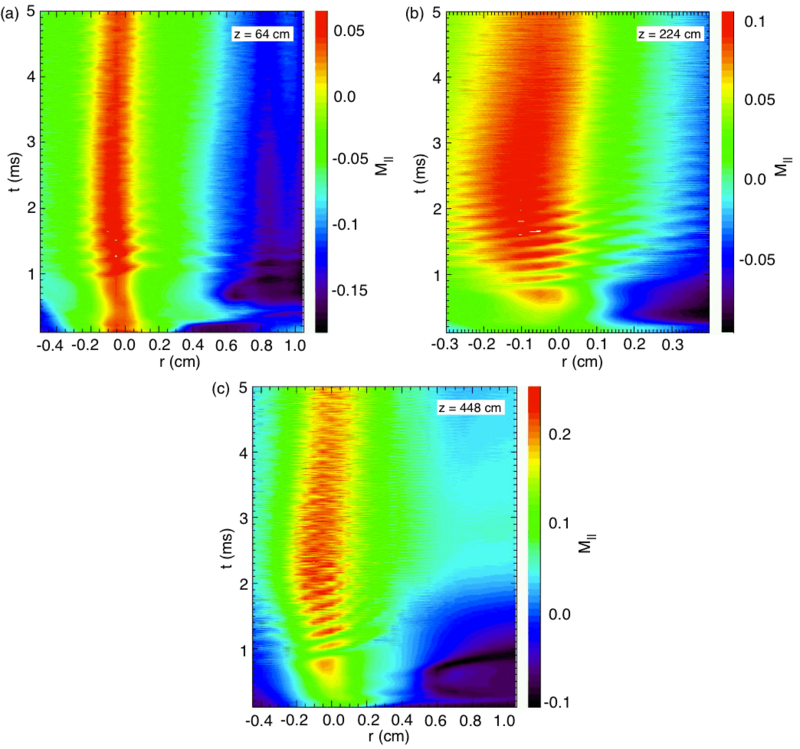 As seen in the figure, the flow exhibits periodic behavior on both a slower timescale (due to thermal wave modification), and a faster timescale (the higher frequency component unlabeled in the figure). The higher frequency component corresponds to the drift-Alfvén frequency, f ≈ 40 kHz. Both the thermal wave and the drift-Alfvén wave modulate the parallel flows. Though the magnitude of the flow fluctuates, it does not change direction. As in Fig. 6.6, the value of the Mach number remains positive throughout the fluctuations. This indicates that the direction of the flow is always toward the LAPD-U anode (i.e., away from the beam heat source). Flow oscillations therefore represent a decreasing/increasing response, and not a change in the absolute direction of the mass transport. These fluctuations do not alter the mean flow. Figure 6.7 presents time traces of parallel flow for two axial positions and various input heating powers. The nearly steady-state Mach number for 20 V in (a) is approximately 0.3, while that value approaches 0.6 further downstream at z = 576 cm in panel (b). Figure 6.7: Parallel flow for multiple input heating powers (expressed as beam voltage) at (a) z = 480 cm and (b) z = 576 cm. Larger Mach numbers for lower values of the heat input also support the model’s finding. Lower values of heat input result in a shorter length of the resulting filament. For any fixed axial position within the filament for a 20 V experiment, a lower input heating brings the end of the filament closer to the measurement position (until the point at which the filament no longer extends to that position). Both panels show a maximum Mach number above 0.6, possibly indicating the end of the filament. In Fig. 6.7b it is possible that the 15 V experiment barely reaches the z = 576 cm position within the heating time interval. The 20 V case reaches this same maximum Mach number earlier in time and then features a decrease to a steady-state behavior. In contrast, the 12.8 V situation never reaches this maximum and is still increasing when the input heating is shut off. Perhaps longer heating times would allow this trace to match the behavior of the others. The theoretical model accompanying this experimental work indicates that the filament length does not change appreciably with increased beam voltage. Furthermore, it suggests, by way of Fig. 6.8, that the end of the filament is well past the measurement locations presented in Fig. 6.7. 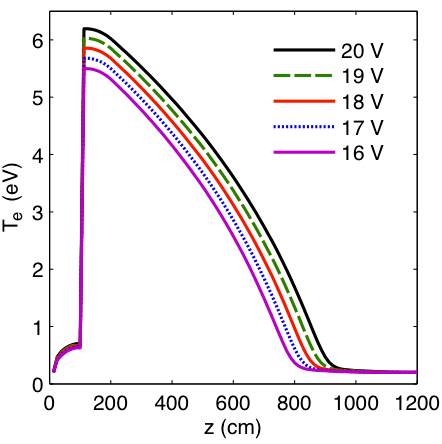 Figure 6.8 is a plot of the theoretical axial electron temperature profile as a function of beam voltage. This plot represents the maximum length of the resulting filament. For the measurement positions of z = 480 cm and z = 576 cm, as shown in Fig. 6.7, the temperature filament certainly reaches the probe. Peaks in the parallel Mach flow are observed for beam voltages between 16 and 20 V in Fig. 6.7a. The model result concerning filament length contradicts the interpretation of the measurements that measured peaks in the flow correspond to the axial end of the filament passing through the measurement location. The temperature filament is predicted to extend beyond the axial measurement locations. Though not shown, the model also predicts that the temperature filament reaches its final length in a very short time, on the order of microseconds. The measured peaks in parallel flow occur much later in time compared to the development of the temperature filament. 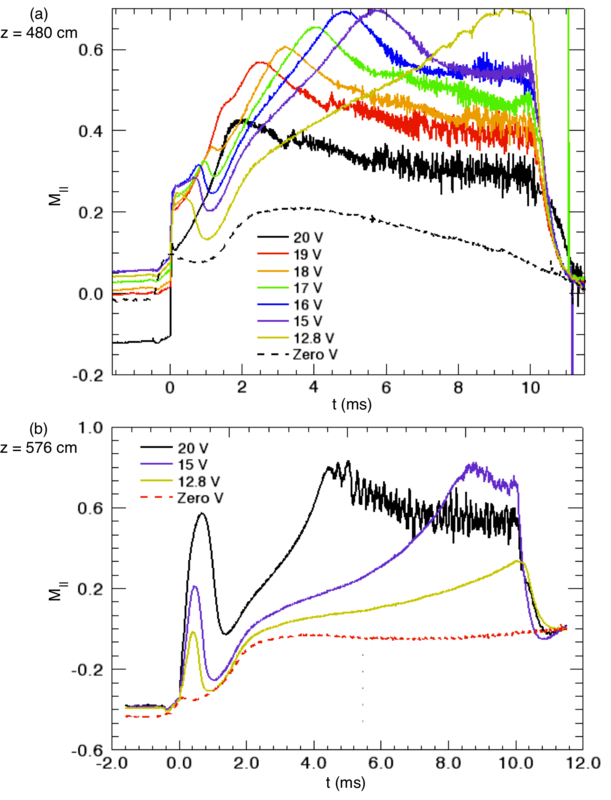 Figure 6.8: Axial electron temperature profiles from a theoretical model for different values of electron beam voltage. The model also suggests that the parallel flow will reach supersonic levels (i.e., M|| > 1) near the axial end of the filament. In Fig. 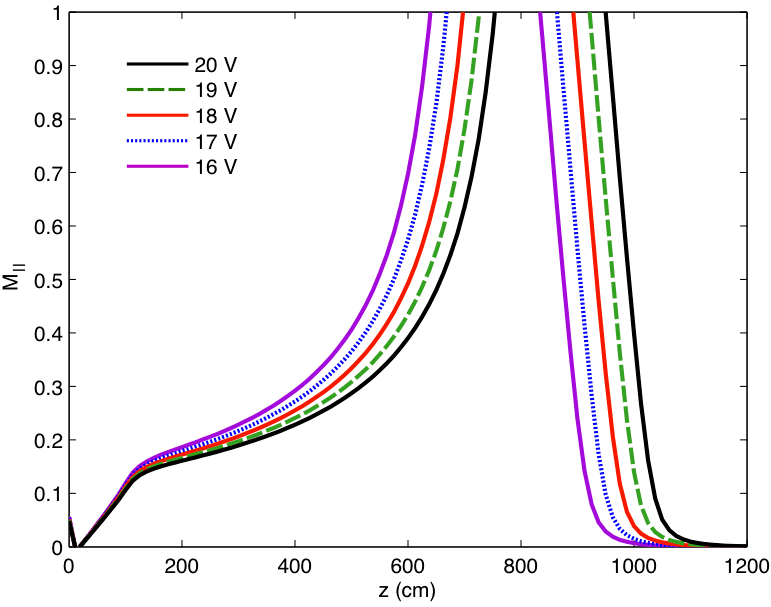 6.9 the parallel Mach number is plotted for a range of electron beam voltages. Comparing this with the theoretical axial electron temperature profiles of Fig. 6.8 shows that supersonic flow occurs near the end of the filament at z ≈ 800 cm. These results suggest that the axial extent of the filament may be determined by appropriately designed experimental measurements of the parallel flow. Figure 6.9: Theoretical parallel Mach number for different values of the electron beam voltage. Measurements of plasma flow is thus far limited to determination of the Mach number in the direction parallel to the applied background magnetic field. Heating from the electron beam results in a flow toward the main LAPD-U cathode-anode pair (i.e., away from the source that generates the temperature filament). Profiles of the parallel flow are considerably wider than those of electron temperature. A fluid model, the same one that provides descriptions of the classical temperature profile behavior, reproduces the qualitative behavior of the measured flow, though the quantitative agreement is not as strong as for the temperature comparisons. The thermal wave modulates the parallel flow. This is observed in the appearance of flow pulses, or bursts, that occur with a time period corresponding to that of the thermal wave. The amplitude of flow fluctuations reaches values of δM|| / M|| ≤ 50%. The fluid model of Shi produces axial temperature profiles that place the filament length within expectations based on the flow measurements. Furthermore, the model calculates that supersonic flows are achieved at the axial end of the temperature filament. The flows have been measured well short of the z ≈ 800 cm theoretical temperature filament length, possibly explaining the lack of a supersonic observation.